"On any given day, you normally consume 7 percent to 10 percent of fat as part of your total calories for the day," said Nidhi Gupta, clinical nutrition manager at Staten Island University Hospital in New York City. "On game day, you're looking at putting 2,000 calories on your scoreboard with 100 grams of fat." Along with lots of extra calories, there's loads of salt to worry about, Gupta added. "On Super Bowl Sunday, sports fans can take in more salt than any other day of the season. If you have hypertension, you need to be aware of how much is too much," Gupta said. "Your blood pressure will rise enough during the game on every touchdown; you don't need to add to your blood pressure score. "Luckily, there are healthier, more creative alternatives to make sure you won't need a Hail Mary to get you out of your food coma come Monday," Gupta added. "There's no reason you can't serve dishes that are still delicious and fun, but that aren't calorie, fat or salt bombs," said Schiff, from Northwell Health's Huntington Hospital in Huntington, N.Y. "Healthy doesn't have to mean boring." 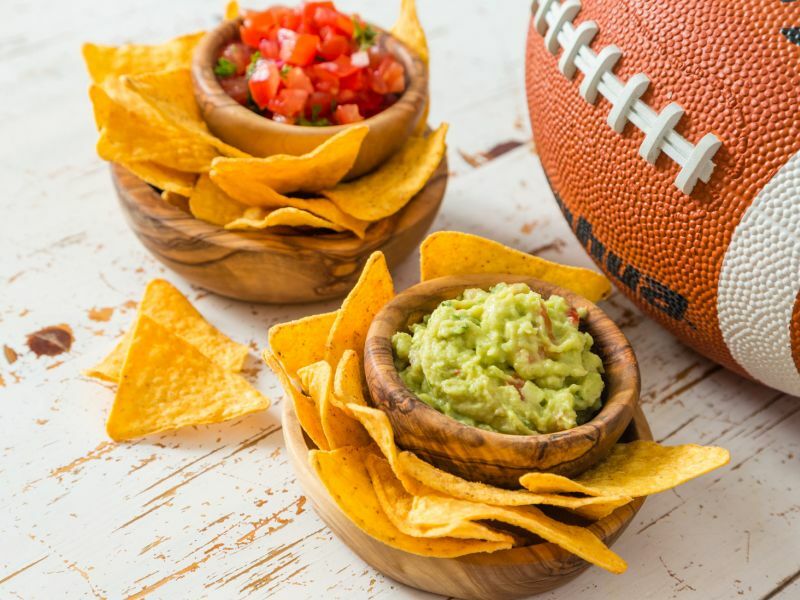 Where to start trimming the fat, salt and sugar from your favorite football-watching recipes? If making chili, try substituting ground turkey meat for beef and load the pot up with white beans, Schiff suggested. "Spice it up with some canned adobo peppers and top it off with a little sharp cheddar cheese, chopped raw onion and a few corn chips. Serve it with baked whole grain tortilla chips," Schiff added. "It will stick to your ribs, and it won't scream 'healthy.' "
If chicken wings are your thing, try baking them instead of frying them, Schiff said. "You'll cut back on the fat, but they'll still taste great," she said. As for avoiding fat-laden dips, use yogurt instead of sour cream for that spinach dip. And try making guacamole dip with some pureed peas and chopped tomatoes, or make a tangy salsa, Schiff suggested. And whole grain and kale chips are healthier options for scooping up those tasty dips. For dessert, you don't have to gorge on brownies. Instead, Schiff said, you can now find dark chocolate hummus next to traditional hummus in your supermarket. "It tastes rich and decadent, and you'll get a dose of fiber and protein," she said. "Serve it with green apple slices or strawberries or pretzels." Another option? "You can take whole strawberries, which are high in antioxidants, and dip them in melted dark chocolate -- which is also high in antioxidants," Schiff said. "Use a vanilla frosting to decorate them so they look like little footballs." SOURCES: Nidhi Gupta, R.D., clinical nutrition manager, Staten Island University Hospital, Staten Island, N.Y.; Stephanie Schiff, R.D.N., Northwell Health's Huntington Hospital, Huntington, N.Y.